Ronnie Moran passed away yesterday at the age of 83. Over nearly 50 years he served Liverpool Football Club in nearly every capacity you can think of; he was a player, a captain, an assistant coach, a manager, a kit man, a physio, a tea lady, and first and foremost a fan. He was an integral part of Liverpool’s legendary “boot room” during their lengthy dynasty and deserves to be spoken of in the same breath as Bill Shankly and Bob Paisley. Moran got his start at the club playing for the reserves while making a living as an apprentice electrician. He was called up to the senior team at a young age and soon became instrumental in dragging the club out of the second division. (This was the 50s, it was a different time.) After helping get Liverpool back into the top flight he was rewarded with the captain’s armband. In later years he would help build the foundations of Bill Shankly’s legendary operation, first as team leader and later as coach. Together they built a culture of success, dominating English and European football much the same way as Bayern Munich conducts business today— peace through superior firepower. Ronnie Moran’s influence on the pitch was manifested twofold. First, in his distinctive shouting from the touchline demanding more of his players no matter how well they thought they were doing. And second, in the manner in which the squad would demolish the opposition. This week we look back at a fixture late in Liverpool’s 1987-88 campaign— one which had Ronnie Moran’s fingerprints all over it. By mid-April of that season Liverpool were all but cruising to the First Division title. Manchester United was following in their wake but the Reds more or less had things in hand. Nottingham Forest came to Anfield near the top end of the table but well behind Liverpool on points; a win at that point likely wouldn’t have been enough. But they did beat Liverpool on their home ground just a couple weeks early, and as always, there pride enough at stake. There was plenty to play for for both sides, even if the title race was all but finished. The problem for Forest was much the same problem that befell too many teams that came to Anfield over the past few decades. They waltzed in thinking they were special, that they had the secret sauce with which these giants of football could be felled. And they got eaten alive. They got eaten alive because their opposition had Ronnie Moran, who had spent more than 30 years at that point transforming Liverpool Football Club from a struggling second division side into an unstoppable war machine. They conquered England many times over. They were imperious in Europe. Every opposition side that walked out onto that pitch had to contend with three things— the sign in the tunnel, the roar from the Kop, and the booming shouts from Ronnie Moran as he demanded his men find new and creative ways to make them suffer. It shouldn’t be too surprising to hear that Forest never really had a chance. Liverpool secured a 2-0 lead at halftime, thanks to goals from Ray Houghton (played through on goal and chipped the keeper from close to the penalty spot) and John Aldridge (another chip, this one from the the edge of the 18 yard box). In the second half the kid gloves came off; Gary Gillespie in the 58th minute with a low shot from six yards out, Peter Beardsley in the 79th with a daisy-cutter inside the box, and Aldridge for his brace in the 88th while the keeper was caught out. Forest got back on the bus with a 5-0 reverse and no small amount of existential angst. Liverpool had a habit of doing that to their opposition at the time. That previous loss to Forest mentioned earlier was the last league game Liverpool would lose that season. They went on to win the First Division title comfortably. Instead of a grand ceremony once the championship was confirmed, players retreated to the dressing room. Ronnie Moran was said to have dropped a box with their winners medals in the middle of the room and told the squad to come get one “if you think you deserve one.” They were then told how many weeks they had until they had to report for preseason training. 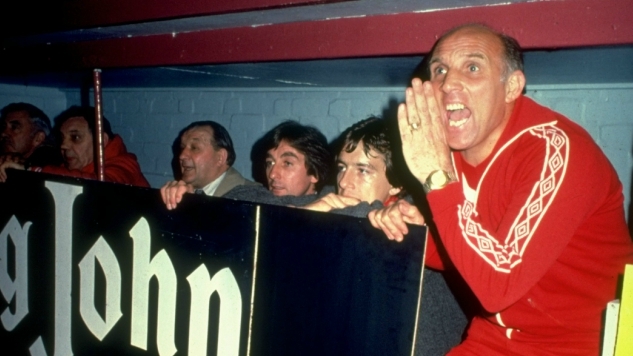 That story perhaps sums up what Ronnie Moran brought to Liverpool Football Club. He helped create a culture where Good Enough never was good enough.